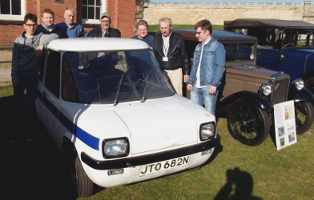 The Enfield 8000 (also known as the ECC - 'Electric City Car'), a 2 seat battery car, was one of 120 built by Enfield Automotive at Cowes on the Isle of Wight during the period 1973-77. 65 were used by the Electricity Council and electricity boards. The company was surprisingly not related to Royal Enfield nor had any connection with the London suburb and was owned by Greek millionaire Giannis Goulandris. 65 of the cars were owned by regional Electricity Boards but the price of £2600 deterred buyers as you could buy 2 Minis for this. 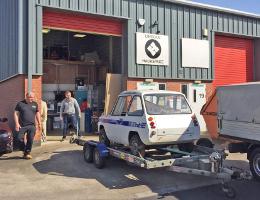 The car featured Hillman Imp suspension, doors from the Mini and a Reliant back axle. Power came from a set of lead-acid batteries and an 8 bhp motor. Production was moved later to the Greek island of Syros, where approximately 100 further cars were built, though bizarrely the cars could not be sold in Greece! Performance for an electric car was not too bad, the range was about 60 miles and a maximum speed of 70mph could be reached. The car was successfully crash tested and the drag co-efficient was supposedly better than a Porsche. We think there are only another 3 or 4 in existence. This car joined our collection in May 2016, and was first on display at our Lincoln Castle Rally. It was donated by Ray Newell, Director of Oakwell Management Services Ltd. They had acquired the car for use in a University project concerning engineering and technical education and it spent some time at the Lincoln University. We are most grateful to Oakwell Management Services and the Lincoln Hackspace Project. The car will receive some light "fettling" and possibly some better batteries before being displayed in the museum, possibly next to our other " baby", the Austin 7.